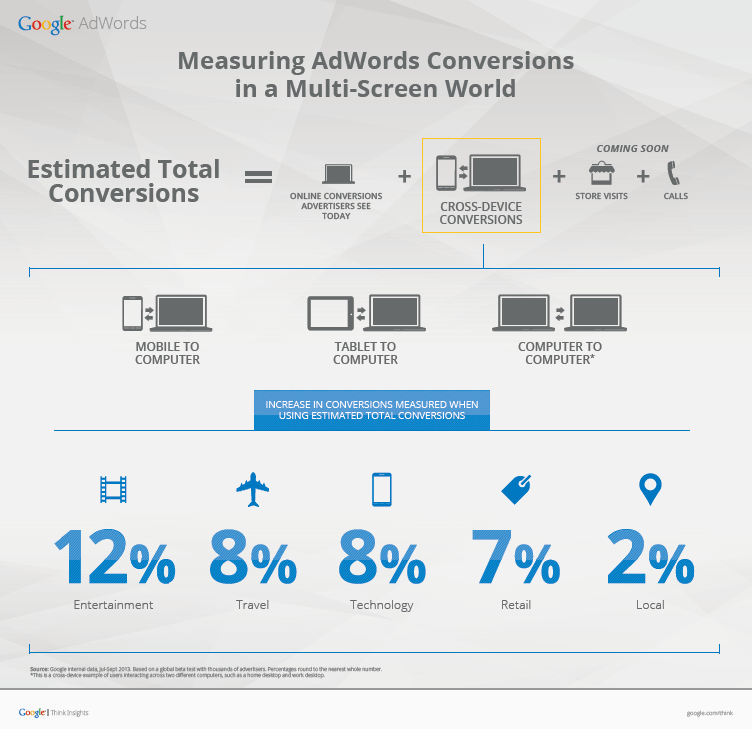 Google has announced it will automatically include estimated cross-device conversions as conversions in AdWords reporting. Originally added to AdWords reporting in October 2013, cross-device conversions estimate the number of transactions (orders, leads, sign-ups and so on) that are completed after a customer uses more than one device or browser. Cross-device conversion estimates are based on “aggregated, anonymised data” from people who have signed in to one or more Google services (such as Gmail, YouTube or the Chrome browser). Estimates are limited to AdWords ads traffic on Google Search pages and the Google Display Network, and exclude app install conversions. Data from people who are signed-in are extrapolated to include people who are not signed in where Google has determined a “strict, highly conservative confidence level.” In assessing conversion likelihood, Google looks at such factors as country, conversion and device type, date and landing page. According to Google, advertisers across the world and in different industries have measured up to 16% more conversions on average by using cross-device insights to get a more accurate and comprehensive view of performance. On first release, AdWords’ cross-device conversions were totalled in a separate column, but last year Google allowed advertisers the option to include these estimates in the Conversions column. Regardless of the upcoming change, the “All Conversions” column in AdWords reporting combines actual conversions (those in the main Conversions column) along with harder-to-measure conversions like phone calls, store visits, in-app conversions, and cross-device conversions. In a blog post announcing the move, Google says that “61% of internet users and over 80% of online millennials start shopping on one device but continue or finish on a different one”. Google’s intent is to have advertisers integrate cross-device conversions into their automated bidding and attribution models. Google wants advertisers to recognise and act on all conversions that, based on its data, it believes can be attributed to an AdWords click. Should you worry that estimates are being totalled together with actual conversions? If you’re using Google Analytics conversion data (or another solution) and not using Google AdWords conversion tracking, you won’t be affected. If you are using Google AdWords tracking but have fewer than 50 conversions a day, you’re unlikely to meet Google’s requirements of 95% certainty in the data with the result that cross-device conversions won’t be shown in your AdWords reports anyway. After August 16, 2016, new AdWords accounts will include cross-device conversions in the Conversions column by default. From September 6, the change will roll out to existing accounts.